However, the absurdity was never a reason to stop for the Belarusian state propagandists. As well as for Lukashenko who was giving speeches recently about planned provocations on the 25th and blaming the fifth column in trying to destabilize situation in the country and at the same time commenting that he is a big proponent of European values. In this campaign anarchists were moved to the second role to be replaced by nationalist organizations “White Legion” from the 90s and a conservative ‘Youth Front’ that was planning to raise from dead and start riots on March 25. Cops even hacked the social media account of one of the former leaders of the “White legion” and started distributing calls to join the demonstration with arms and start revolution. Lukashenko was trying to remove his opponents from participation in the protest on March 25 by putting them to jail for short terms. Thus leaders and rank-and-file activists of liberal and nationalist opposition landed in jail for 10-15 days for previous actions. Only several of them managed to stay out. The main figure behind the idea of the protest on the 25th is Nikolai Statkevich – an authoritarian leader of the oppositional Belarusian National Congress – disappeared one day before the demonstration. By the time this article is written there is no information of his whereabouts. Apart from that 4 days before the demonstration police around the country started hunting the remaining activists of the opposition detaining them and sentencing to 10-15 days in jail for disturbing public peace. Several members of a paramilitary right-wing group “Vaiar” were also arrested and now charged with preparation for mass riots (right now over 30 people are accused under this article (including the non-existent ‘White Legion’ and possibly anarchists) with clear falsifications and state media campaign working to create hysteria – for example airsoft guns were presented as firearms and shovels as weapons). Heads of the state universities informed the students that any person who takes part in March 25 demonstration will be excluded. Those threats were made reality for some people who were already detained before. This strategy is not new and was actively used by the government to kick out hundreds of students in the last 15 years. March 23 and 24 was marked by the most intensive police raids in last years. Cops were breaking the doors of those they wanted to detain. In several cases fire brigade was called to get inside of the flat. In one of the situations police started a fire on the stairs of the block house, called the fire brigade and with help of the fire fighters managed to get into the flat of the person. On 24th and 25th raids were also performed in the flats of those who were already detained before and were by that time in jail. Pending criminal cases in some situations not connected at all with politics were used as an excuse. For example raid in the office of an independent union connected with opposition was officially performed due to a bank robbery that happened months before. Anarchist were part of the target group of repressions. Apart from raids in empty flats, cops started detaining people they knew somehow connected with anarchism before. As a result more than 10 people were arrested on March 24 and sentenced to 10-15 days in jail (no clear numbers of detainees are available right now). On March 24 a small group of people have organized gathering of food and money for those detained on March 15. After half an hour of gathering police came and detained all the people among whom were several anarchists, journalists and relatives of the arrested. Journalists were later released, but 10 people who were detained were sentence to 12-15 days in prison. Among those almost half are anarchists. By the morning March 25 scattered groups of anarchists were still planning to join the demonstration. Over 100 people were held in prison including around 30-40 anarchists. Opposition was agitating for March 25 as the turning point of the whole protest. The Internet was full of calls to join. Opposition media was creating the atmosphere that revolution is going to happen on this specific day. Peaceful revolution of course (otherwise Western sponsors wouldn’t approve). Police didn’t ignore this mobilization and prepared for the biggest repression operation of all time. Buses with riot cops and internal troops (military wing of police department) were mobilized to Minsk. Cops brought all the toys they managed to buy in last years including Canadian water cannons, German machine guns, jeeps to ramp the crowd, communication jammers and dozens of riot vans. 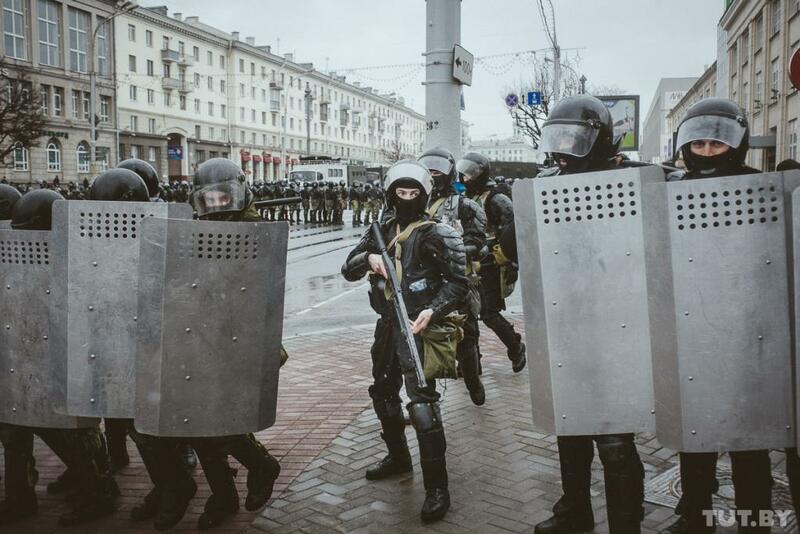 Hours before the demonstration was supposed to start the city center of Minsk looked like it was under siege by police. People’s identities were controlled. The gathering square was blocked by hundreds of riot cops. Metro stations close to the gathering point were blocked, public transport was not allowed to stop close to the demonstration place. In spite of all the police people came. The planned time for the gathering was 14:00, but people started coming earlier and of course detentions started. One by one riot cops started picking up people and bringing them to “Autozaks” (belarusian produced riot vans). At that point a group of anarchists and supporters was detained as well – all in all 25 people. At least one of the anarchists ended up in the hospital with head trauma. After 14:00 more and more people started gathering at the edges of police lines and in one case group of 1000 people was formed and started marching through the city center. Police reacted immediately to this and started detaining people. In next hours about 600 were detained (no clear numbers are available right now – cops didn’t make any statement on arrests and the state TV was reporting that everything was fine in the city). Later that evening police started releasing detainees, however more than 100 people are still kept in detention. In the evening solidarity demonstration on 26 was called. 100 people came to this meeting in the city center. Around 20-30 people were arrested and are waiting for trial. The court will start working on Monday and it is clear that people will get punished for the demonstration with days in jail (police can give fines without the trials). Lukashenko is making daring steps in his politics – in 2010 the same steps lead to his isolation from European political scene for over 5 years. This time he is checking how far he can go. So far there are “concerns” by the European politicians about repressions in the country, however the further common work with Lukashenko from EU is highly probable – in the last years Western partners were already closing eyes on violations of human rights. So it is less likely that new sanctions against Lukashenko will be introduced. At the same time repressions of that scale have scared Belarusian society only for short moment. The economic crisis and hardships of the population outside of the capital are not going to stop in the near future. This is making us believe that further growth of the protests is possible with short moment of decline. The dedication of simple people yesterday have shown that they want changes and they are not afraid to go and get it- at least several thousands of people around the country. We are calling people for solidarity actions all around the world – make it visible that your government is working with the Tyrant from Belarus. Show your support of the Belarusian people and anarchists in their struggle against dictatorship. Apart from that big financial support is required. People are going to lose their jobs after the protests and we would like to help them at least for the first moments. Paying for the lawyers and parcels might be required in case Human Right organization withdraw their support or not capable of further support of anarchists.